Pumpkin salad with goat cheese - delicious! An amazing combination, I discovered a few days ago. Now that the season of pumpkins in full swing, and only think about on the subject of cooking variations: what to eat, how to apply, and to be useful, and not "beaten", and very tasty. And in my head I had the idea to prepare a salad of pumpkin and ... Quinoa. Мысль эта озарила меня как раз в связи с тем, что на днях я получила посылку с iherb with groats quinoa (As we call it :) quinoa. Very much I would like to try this super-hyped product, included in the top-20 most useful food in the world. Of course, I cooked quinoa and immediately tried out as a side dish. I can say it is definitely tasty and unusual. Small grains (such as mustard), razvarivayas well, however, retain their shape, are crumbly and even seems to burst in your mouth. The taste can not be compared with anything, he is not like other cereals. The only negative - cereals in the package is not much, not Nawar porridges a big family :) On the other hand, based on quinoa, obtained a delicious salad, rich in easily digestible protein (14 100 g per g), beneficial fats (6 g), and precious minerals microelements. Combine quinoa can be with any vegetables, chicken, greens, avocado, citrus, pomegranate and others. In short, if you love pumpkin, goat cheese and gastronomic experiments sure you his vote. salt, black pepper - to taste. *Also suitable arugula, fresh spinach, salad mix. Pumpkin clean and cut into small cubes. Bake in the oven (you can sprinkle a little oil) 20-30 180 minutes with degrees not overdo! Cooked pumpkin should be cool. Meanwhile, put to cook grits. Rinse it does not necessarily just fill 300-350 ml of water and boil 15 minutes (croup should fully absorb the water). Cool movie. Cranberries, soak in warm water minute 15-20. Then drain and rinse the berries, a little dry them on a paper towel. In a large bowl, send lettuce, chop, at its discretion, baked pumpkin, quinoa, walnuts (smash, but not very finely) and dried cranberries. Fill the olive oil, add salt and pepper to taste. On top decorate with shredded goat cheese. Serve the salad can be both warm and cold. Butternut squash or pumpkin-squash salad fit well. But if you can not find them, use any. Goat cheese in a salad can be replaced by blue cheese, and crumble it on top. 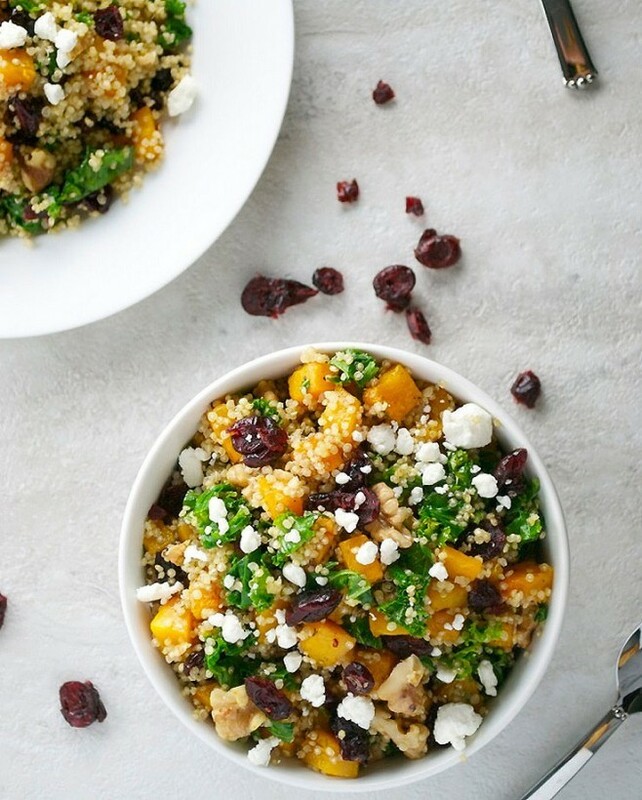 Its delicious taste perfectly complement a salad of pumpkin and quinoa. Instead of olive oil you can try as refueling pesto. With a pumpkin, he combines great!